After an incredible 2 year stay in Spain, Visions of Spain, the collection of paintings by Valencia’s Joaquin Sorolla, is headed back to its home in New York City. By any measure, the tour was immensely successful — more than two million visited the exhibition on tour in Spain’s biggest cities, including Madrid, Sevilla, Barcelona and Valencia. 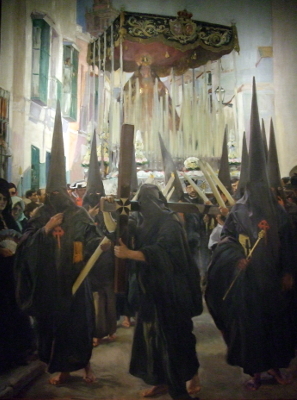 Sorolla painted these gigantic canvases in the 1910’s with the purpose of introducing his country to the United States. The commission came from the Hispanic Society of America, the seat of which is in New York. If you’re in NYC, please don’t pass up the chance to visit the society’s headquarters, off Broadway & 155th, and see the paintings. The vibrant, idealized scenes may not be literal depictions of Spanish life, but they convey the right sense. It’s re-opening in May, 2010.